Balboa Water Group Conditions of Use policy. 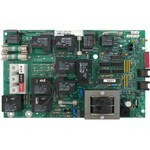 Over the years Balboa Water Group® has manufactured hundreds of circuit boards for many different spa manufacturers. It is very important that you do not order a circuit board based on looks, several boards look a like but have different software or chips. 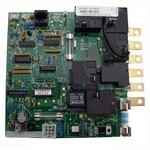 It is the chip that drives the board and gives it its unique functions. To correctly identify a circuit board the chip number should be used to identify it. It can be found on a white sticker near the center of the circuit board*. 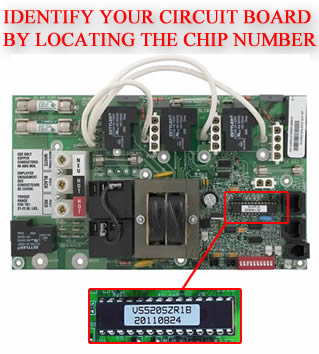 Another number that is helpful in identifying a Balboa® circuit board is the five digit number found on most boards (5****). Locate the spa manufacturer of your spa below. Locate the chip on your circuit board and match it to one of the chip numbers shown. Most circuit boards have a revision letter "(x)" at the end of the chip number and in many cases a board will go through several revisions which will change the end letter, for example from "A" to "B". Newer revisions usually indicate an upgrade or improvement. You will always receive the newest revision if available. If you do not see your board listed below, please email [email protected] with the spa manufacturer, chip number and five digit numbers (5****) if available. Remember do not order a circuit board based on looks, the chip number must match the number on your board in order for you to get the correct board.